Waterpik Aquarius Review: Is This The Best Water Flosser Around? The Waterpik Aquarius WP-660 is the flagship device from the creators of the water flosser. Widely considered to be the best water flosser on the market, its range of features makes it the perfect device for pretty much everyone. 11500 Amazon reviewers agree! 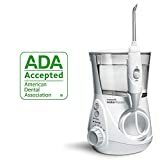 The ADA-approved Aquarius uses award-winning, patented technology to clean deep between the teeth and below the gumline. It not only replaces the need for conventional dental floss, but does an even better job at improving gum health, and is a must have for anyone with braces. As water flossers gain more and more popularity, more devices are hitting the market and the quality can vary significantly. 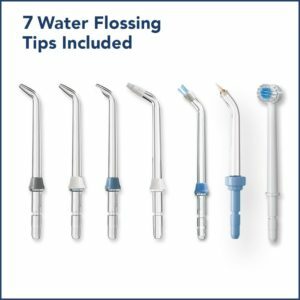 Educating yourself about the essential features of a water flosser can prevent you from spending your money on a product that is ineffective. In this Waterpik Aquarius Review, we will cover all the need-to-know aspects of the Aquarius so that you can decide if it is the right product for you. How Does The Waterpik Aquarius Work? How Does The Waterpik Aquarius Compare? Who Is The Waterpik Aquarius Suitable For? The Waterpik Aquarius uses patented Waterpik technology to thoroughly clean hard to reach areas in the mouth. This technology uses pressurized water and a series of lightning fast pulsations to achieve a highly effective clean (view details). Pulsating water is proven to be more effective at cleaning than a continuous stream of water, but many other water flossers available to not incorporate this feature. The Waterpik Aquarius has a range of color options and also a designer range which includes extra visual features such as chrome accents and more colors. The Waterpik Whitening Water Flosser WF-05 is also available. This is a new addition to the Waterpik range and is essentially the Waterpik Aquarius with added whitening capabilities. The Waterpik Aquarius boasts 10 pressure settings ranging from 10-100psi. You can quickly select the pressure by turning the easy-to-use dial on the body of the device. If you have healthy gums and teeth, and are already familiar with water flossing, the upper pressure settings can help you achieve an extra thorough clean. 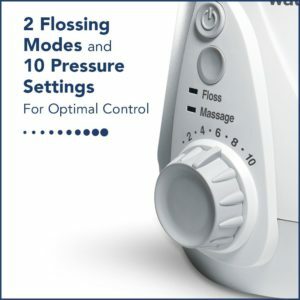 While the lower pressure settings can often be disregarded because they aren’t as powerful, low pressures are perfect for new water flosser users. On the Aquarius, low pressures are essential for the extra features like periodontal cleansing and massage mode. Even on the lowest setting, you can be sure that you are getting a thorough clean. This is because the Waterpik Aquarius doesn’t rely solely on pressure to dislodge debris and plaque. The water is also pulsating at 1400 pulses per minute. Although this is too fast to see, the pulsations significantly elevate the cleaning abilities of the water flosser (view details). Nearly all water flossers have an element called a reservoir. This is a container that holds the water before it gets pressurized. Generally, the larger the reservoir, the longer time you have to floss and make sure you do a great job. 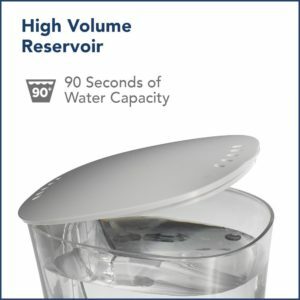 The Waterpik Aquarius has a 22oz reservoir — one of the largest water flosser reservoirs out there. This means that, even at full pressure, you can floss for 90 seconds without having to refill. Waterpik advise that you floss for 60 seconds daily to improve your oral health, so 90 seconds is definitely enough — and more! The Waterpik Aquarius comes with a range of different tips that allow you to tailor your flossing experience to your needs. These tips are color coded at the base so that if a device is being shared, each user can still easily identify their unique flossing tip. The tips all have 360 degree rotation which allows you to easily reach all parts of the mouth without excessive movement. This is an essential feature for anyone with limited mobility. The Classic Jet tip is the most commonly used Waterpik tip and good for general everyday use. It does a great job of cleaning between teeth and below the gumline. It’s also clinically proven to be twice as effective at improving gum health than conventional dental floss. The Plaque Seeker tip is perfect for maximising results with dental implants, crowns, bridges, and other dental restorations. It has three tufts of bristles on the end of the tip that sweep around dental work, removing plaque and debris from the most stubborn places. This tip is great for anyone with braces and built in retainers. It has a short brush on the end to help access areas around the braces and is clinically proven to significantly improve gum health in orthodontic patients. The special design of the Pik Pocket tip means it can deliver therapeutic rinses deep below the gumline. It is great for anyone with gingivitis who struggles with periodontal pockets or furcations. This tip should only be used at low pressure. The toothbrush tip is a great idea but often an unused tip. Its design allows you to brush and floss your teeth simultaneously, but in reality, this is often messy and few people choose to use this tip. However, if you’re someone who is short of time and would otherwise skip the flossing step, the toothbrush tip could be a helpful one for you. The Aquarius has space for two flossing tips to be hygienically stored behind the reservoir. However, if you require more storage space, a separate flossing tip case is available for purchase. The Aquarius has a built in timer and pacer that will briefly pause after 30 seconds to prompt you to switch from the bottom teeth to the top teeth. It will then notify you again when you reach the recommended 60 seconds of flossing time. The water flosser will continue to run until you manually switch the device off, and both timers can be deactivated if you require. Very few water flossers feature a massage mode. In fact, not even all Waterpiks have it. This feature is definitely not essential, but it can be a great asset. Massage mode helps to improve gum health by gently stimulating the gums and increasing blood flow to the area. It can also help to dislodge any debris that is stuck below the gum line. If you suffer from gingivitis, then this feature makes the Waterpik Aquarius a must have for you. It’s helpful to have a handy switch to stop water flow as water flossers can be messy. Recommended flossing position is with your head down, looking at the plug hole, so having a pause button at your fingertips really helps. It doesn’t turn the device off but temporarily halts the water flow. Don’t forget to power off the unit when you are done. The LED display allows you to easily identify which mode you are using. Waterpik pay close attention to detail with all their products and little features like the rubber feet on the Aquarius add up to a quality device. Seemingly a minimal feature, the rubber feet reduce movement on a wet countertop. It always stays put and you never have to worry that a reservoir full of water will accidentally slide all over you! The Waterpik Aquarius is arguably the best water flosser on the market. We featured it in our roundup of the best water flossers of 2018. It comes packed with features and its 11500 reviews on Amazon are proof that it really works. The different color options mean that no matter your style, there will be an Aquarius for you. However, one point to bear in mind is that this is a countertop device and not a portable water flosser. It is bulky and does not have global voltage, making it difficult to take on the road. 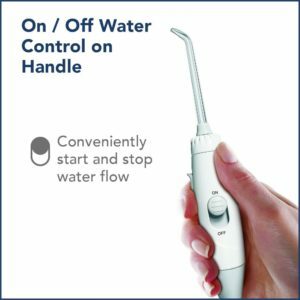 If you’re looking for something that is still powerful but more portable, check out the Waterpik Sidekick which is the smallest countertop water flosser yet. The Waterpik Cordless Advanced or the Cordless Plus would also be great options for travelling. For smaller budgets, consider taking a look at the H2O-Floss HF-8 which has excellent functionality for the price. Waterpik is one of the most trusted oral health brands, both in terms of results and the reliability of their products. It is not uncommon for Waterpik owners to get many years of use out of their products. When investing in a Waterpik, you can rest assured that you are buying a quality product. However, as with all products, the best way to maximise the life of your Waterpik Aquarius is to use it and care for it correctly. The Aquarius is very simple to use and can be ready to go very quickly. Select and insert tip. Make sure that it fully clicks in. Floss! With the handle switch off, turn the device on. Place the tip of the flosser in your mouth and lean over the sink. Slide the handle switch to on and guide the water flow in between teeth and along the gumline. Keep your mouth slightly open so that the water can run out. Before first use you will need to prime the unit. Let some water run out into the sink before you start to floss. For more details visit our handy How To Use A Waterpik guide. Before cleaning, ensure that the device is unplugged. Wipe down the exterior with a damp, soft cloth and a mild non-abrasive cleaner. The reservoir is dishwasher-safe and can simply be removed and placed on the top rack of dishwasher. Depending on the mineral content of your water, it is not uncommon for hard water deposits to form. This can really hinder the performance of your water flosser. To prevent these from forming, add 2 tablespoons of white vinegar to a full reservoir of warm water and let the solution completely run through the unit. For best results, do this every 1-3 months. If you do run into problems with your Waterpik Aquarius, rest assured that it comes with a 3 year warranty. They are also active on their social media platforms: Facebook and Twitter. The Waterpik Aquarius is one of the best investments you can make for your oral health. Its award-winning patented technology means you just can’t get the same experience from a water flosser outside the Waterpik family. Packed full of features, it is able to provide a comfortable, tailored flossing experience to anyone and achieves the best results. Can you use mouthwash in the Aquarius? Yes — you can use mouthwash in your water flosser. Just bear in mind that the reservoir is large, so using all mouthwash can become expensive quickly. Some user prefer to floss with a mix of water and mouthwash. Can you put Waterpik whitening tablets in the reservoir? No Waterpik whitening tablets are solely for use with the Waterpik Whitening Water Flosser. These slot into a specially designed handle and should never be put in the reservoir of any water flosser. Does the Aquarius have global voltage? No it does not. For use outside of North America and Canada, a 220-240v version is available. How loud is the Aquarius WP-660? The Waterpik Aquarius is quite loud to operate. This is an important thing to consider before purchasing. If you do find that your water flosser is too loud, try placing a folded towel under the base to absorb some of the sound. Can the Aquarius be shared between family members? Yes — you can share flossing units between family members. However, each person should use their own individual flossing tip for hygiene purposes. Does this replace conventional flossing? The Waterpik Aquarius can replace conventional flossing. However, if you still find you would like to floss after, then you can.